150 primary students today enjoyed reading sessions during an activity organized by the National Literacy Agency. Għidli Storja (Tell me a Story) is one of the initiatives that the agency organizes in schools. Before the Easter holidays, the 150 students from Government primary schools had the opportunity to listen and watch Chip Colquhom, who works with Oxford Reading Tree and is known for the art of story telling, even with singing and acting. In order to push forward the skills of reading, the National Literacy Agency is distributing thousands of books – a 100 in each class – to enhance the culture of reading. Education Minister, Evarist Bartolo, said that the country’s future depends on the work carried out in schools. He said that literacy is not only in books, but also in digital form. He added that the country has great challenges to strengthen the English and Maltese languages. Minister Bartolo emphasized that if children are not well familiar with English, they face problems with digital literacy. He also spoke on the need of strengthening the Maltese presence in the digital world and on Wikipedia. 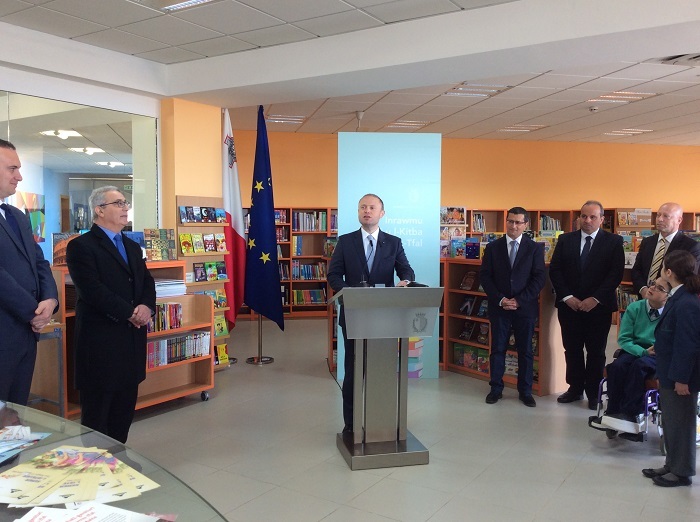 Prime Minister Joseph Muscat said that the Government is making efforts for the creation of programmes intended to keep the Maltese language alive in the digital world. He stated that the Government is investing both in infrastructure and even in students so that they are kept abreast with developments. He said that great progress was made, however a long road lies ahead to increase literacy. Among the initiatives taken by the Government, Dr Muscat mentioned the removal of the fee which was requested from students to apply for MATSEC exams and each year lessons are offered to students who fail some of the MATSEC exams.